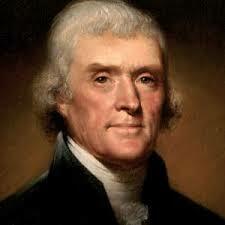 Why do I not like Thomas Jefferson and why should you care that I don’t like him? First let’s get some things out of the way. Thomas Jefferson held slaves. They were property. And there’s evidence he may have fathered children with Sally Hemings who was chattel, and who had no consent. While there is also some evidence Jefferson may not have fathered children with Hemings, what matters is the hypocrisy of the founding generation of America’s leaders, for whom the principles of freedom and equality could be easily erased when it came to slavery. The hypocrisy is America’s own for no other nation prior was ever founded overtly and sequentially around human rights. We did it. We own it. When Americans fail we are greater failures than the people of other nations. It is right to hold Thomas Jefferson to this standard: “We hold these truths to be self evident: that all men are created equal”—he owned it, he failed, we failed, and in many respects, where human rights and individual liberty are concerned we continue to founder. Foundering is not a decidedly American thing. All nations fall flat when it comes to equal protection under the law and guarantees of human rights—there never has been a perfect country and quite likely there never will be—but America declares itself, if not perfect, sufficiently noble of vision and unselfish of governance to believe we can become perfect. We are a more perfect union. So as a professor teaching a course on Thomas Jefferson at Syracuse University, I say I do not like his essential hypocrisy. His refusal to free slaves at Monticello (notice I do not say “his” slaves, for rhetoric should be precise) constituted a de facto guarantee African-American citizens would never have the same opportunities as whites. Our nation’s banking systems, our means of inheritance, the origins of our universities, all stood on racism. Jefferson didn’t stand alone in this heinous affair. Madison, Adams, even Hamilton all profited from slavery, even as, in Hamilton’s case he argued against the ownership of human beings. How can I possibly like our third president? I only care about his writing hand. I care that he wrote this: We hold these truths to be self-evident, that all men are created equal, that they are endowed by their Creator with certain unalienable Rights, that among these are Life, Liberty and the pursuit of Happiness.–That to secure these rights, Governments are instituted among Men, deriving their just powers from the consent of the governed, –That whenever any Form of Government becomes destructive of these ends, it is the Right of the People to alter or to abolish it, and to institute new Government, laying its foundation on such principles and organizing its powers in such form, as to them shall seem most likely to effect their Safety and Happiness. I like “unalienable” because it means rights can’t be given away. I like it that governments are instituted among men to secure life, liberty and the pursuit of happiness. Whether those old aristocrats knew it or not, they adopted the most radical idea in all of history in that hot Philadelphia summer. A government that stands for “life” “liberty” and the pursuit of happiness, that believes people are created equal must grow, must assert the rights of everyone, and must never be excused for failing to secure the safety of all. I know post-modernists who believe the Enlightenment must be dis-articulated owing to colonialism, white privilege, and even a suspect rationalism. Of course the irony remains. It’s the Enlightenment that allows for free thinking. But it’s not the Enlightenment that created the United States. Not precisely. I believe it was Jefferson’s pen. Where is Jefferson given Yeats’ optimism and evident irony? Thomas Jefferson asked us, all of us, by means of his quill pen, to believe the best of every man. This is the American irony of ironies: we will all make bad men show themselves at their best and encourage the good to swing their lanterns higher. I don’t have to like him. This is in no small part how I survived the last two years. Putting such faith other, including myself, has caused the lantern to be swung higher.” Thanks for the blog.